HK-I, a type of X-γ radiation alarm of personal dose equivalent (rate) – is the latest improved radiation protection for individuals. 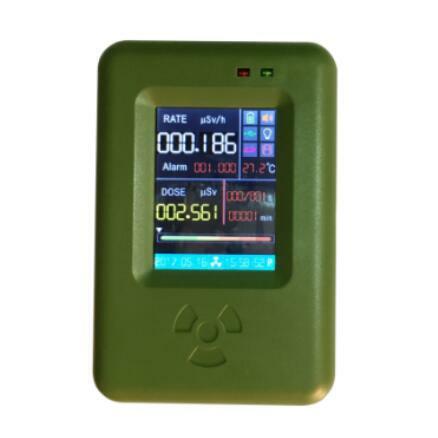 The instrument is mainly used for protection monitoring for X, γray and hard βray radiation, applicable in the field of nuclear power plants, accelerators, isotope applications, industrial X, γ nondestructive testing, radiology, cobalt source treatment, γ irradiation, radioactive laboratories, nuclear facilities ambient monitoring, etc. * Fashionable appearance, comfortable handle feeling, skid proof edges. * Built-in 128K Flash storage space can save up to 14,440 records (Automatically overwrite the old data when no enough space). Built-in query engine can check the saved data at any time and show the data via curve drawing. * Powerful ARM instruction and floating point arithmetic ability of mathematics can quickly calculate the changes of surrounding nuclear radiation and take related reaction. •Display 6-digital true color screen with touchable. •Particular Gaussian Filter algorithm that can measure radiation and stabilize data quickly. •Backup data or print real-time data by USB interface. •Ambient temperature range from -10 ℃ to 125 ℃. or CPM from 0 to 6000. •Timer: auto sampling period of 10 ns to 20 seconds. •Count light: Red LED flashes with each count. •Count click: speaker can click sound with each count. •Count vibrate: motor vibrate with each count.